Rob Kampia is co-founder and executive director of the Marijuana Policy Project in Washington, D.C.
During his run for the presidency, Barack Obama instilled hope in medical marijuana supporters by pledging to respect state laws on the matter. And for the first two years of his term, he was generally faithful to his promise. Yet suddenly, and with no logical explanation, over the past eight months he has become arguably the worst president in U.S. history regarding medical marijuana. 1. In 1970, Nixon signed into law the Controlled Substances Act, which placed marijuana in Schedule I -- the most restrictive of the five schedules, which declared that marijuana has no medical value whatsoever. 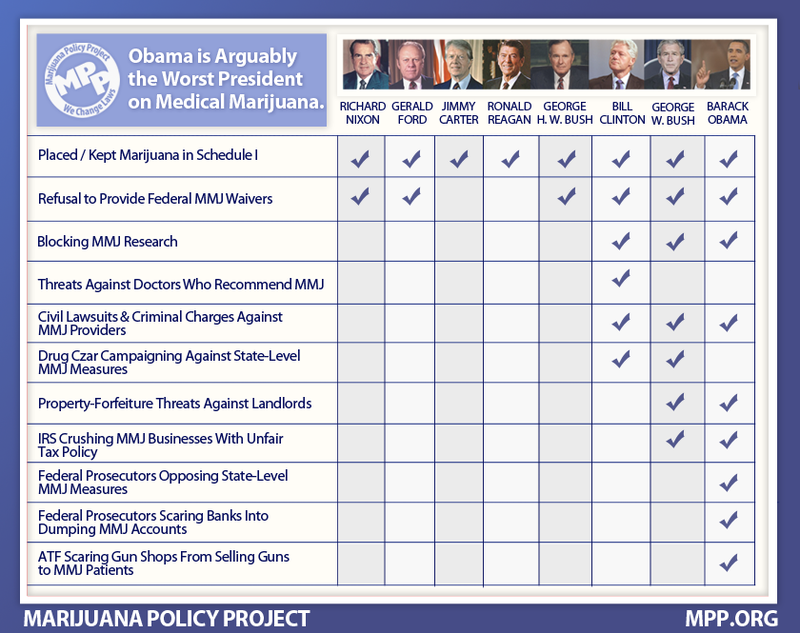 Since then, all seven presidents have been content to keep marijuana in Schedule I, even going so far as to have (1) DEA bureaucrats overrule the DEA's own administrative law judge on the matter, and (2) Health & Human Services reject scientific petitions for rescheduling. 2. In 1978, the Carter administration created the "compassionate IND" program, which allowed patients to apply to (what is now known as) HHS to legally receive monthly shipments of the federal government's marijuana. Reagan left this program untouched for all eight years of his administration, but the first Bush closed the program to new applicants halfway through his term. 3. From 1969 to 1992, it was relatively easy for state governments and private institutions to investigate marijuana's therapeutic uses: The mechanism was to get FDA approval for a research protocol, then obtain DEA permission to store and handle the marijuana, and then NIDA would provide the marijuana. After Clinton took office, his team created a new hurdle, requiring a separate HHS review of the scientific merit of an FDA-approved research protocol, which has essentially prevented all but a few research projects from moving forward over the last 18 years. Indeed, just last month, Obama's HHS rejected an FDA-approved protocol that would have researched whether marijuana can reduce PTSD among combat veterans. 4. After California voters passed the first state medical marijuana law in November 1996, the Clinton administration threatened to take away the prescription-writing authority of physicians who recommend medical marijuana to patients. This bad policy was successfully blocked in federal court on First Amendment grounds. 5. In 1998, the Clinton administration filed a civil lawsuit to close down the premier Oakland dispensary at that time; this case went all the way to the U.S. Supreme Court, which ruled 8-0 against that dispensary in 2001. Since then, the Bush and Obama administrations have routinely dragged dispensary owners into federal court. Most recently, on October 7, Obama's four federal prosecutors in California announced a coordinated plan to shut down most dispensaries in the state. 6. Clinton's drug czar actively spoke out against good ballot initiatives in 1996, 1998, and 2000. And Bush's drug czar campaigned against ballot initiatives and state-level bills for all eight years of the Bush administration. Obama's drug czar hasn't lobbied or campaigned against medical marijuana reform measures (yet), but he has publicly opposed medical marijuana generally. 7. In 2000, Clinton signed into law a bill that made it harder for the federal government to seize property through civil lawsuits. Unfortunately, the federal government can still wreak havoc when it wants to, and the Bush and Obama administrations have both threatened some landlords (almost exclusively in California) with property forfeiture if they lease their properties to medical marijuana growers or dispensaries. 8. The IRS started going after medical marijuana businesses under the second Bush regime, and the IRS has continued doing so under Obama. In a fluke of how federal law is written, the IRS is arguing that businesses can actually deduct the cost of the marijuana that they're selling, but businesses cannot deduct other costs (rent, salaries, insurance, supplies) that any other business would normally deduct. If this doesn't change, almost all dispensaries will either go out of business or become tax evaders; either way, the federal government will be deprived of tax revenues. 9. This past spring, Obama's U.S. attorneys in Arizona, California, Colorado, Hawaii, Montana, New Hampshire, Rhode Island, Vermont, and Washington state issued letters to local and state government officials at carefully chosen times, for the purpose of killing medical marijuana reform measures or hampering implementation in each state. 10. Over the last couple of years, medical marijuana businesses have been having trouble finding banking institutions that are willing to accept their money. When members of Congress asked Obama's Treasury Department for guidance, the Treasury Department said that each banking institution would have to determine its own tolerance for risk -- without defining what might constitute a risky situation. And now, just in the past couple of weeks, the Obama administration has been scaring California banks into dropping all businesses that are involved with medical marijuana. 11. On September 21, Obama's ATF issued an open letter saying that gun shops cannot sell guns to medical marijuana patients -- or people who are known to be addicted to drugs other than alcohol or tobacco, ironically enough. So those are the footnotes for the chart. Depressing, huh? But there may be a way forward through this mess: Since Colorado, Maine, and New Mexico set up state-licensing systems for medical marijuana businesses in recent years, literally zero such businesses in these three states have been raided by the feds. Technically, federal prosecutors can civilly or criminally target any marijuana businesses they want -- in any state -- until we change federal law. But, for the time being, the feds appear not to be targeting medical marijuana businesses with state licenses. So we may have a way forward. Unfortunately, the plan now assumes hostility from the former marijuana user in the White House who used to profess notions of hope, change, and compassion toward the less fortunate. Shame on him.